Synesthesia Test | Are Your Senses Crossing Paths? Auditory-tactile synesthesia (or hearing-touch synesthesia) is a rare sensory phenomenon where the affected individual experiences tactile sensations in response to sound. This can manifest in myriad ways. Auditory stimuli might cause a tingling sensation (sometimes discomforting), a localized pressure or tension, or, what some describe more generally as a “feeling.” The stimuli can range from classic rock tunes to movie sound effects to the enveloping tones of the world around you. This Quora thread provides some insight into these experiences through the lens of those affected. 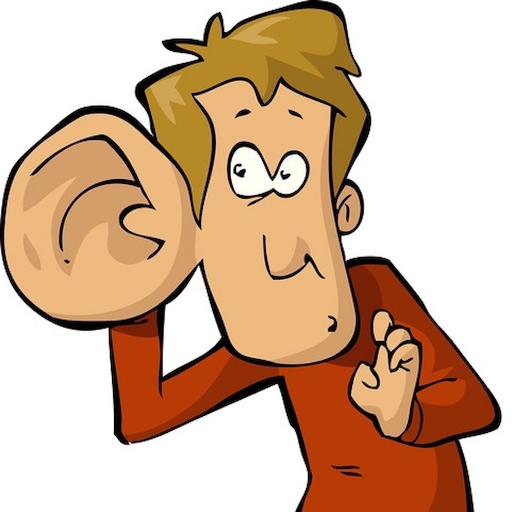 What causes hearing-touch synesthesia? As is true of most forms, we posit that these experiences are fundamentally human—i.e., all of us have some capacity for encountering them. To more deeply understand how this applies to hearing-touch, we can look at some research: A Neural Link Between Feeling and Hearing (2012) by Ro, Ellmore, and Beauchamp. If you’re interested in this sort of thing, I recommend that you read the full text (it’s quite manageable). We’ll focus on a key takeaway. In this paper, the authors “show that there are extensive ipsilateral connections between the primary auditory cortex and the primary and secondary somatosensory regions in the human cerebral cortex.” Let’s unpack that a bit. “Ipsilateral” means something that affects the same side of the body, and “somatosensory” refers to the part of the nervous system that encompasses the sense of touch. With that, we have a neurological basis for the idea that an auditory stimulus can result in a tactile sensation. But that’s only half of it. Most interestingly, the paper includes an analysis of a patient (SR) who has acquired auditory-tactile synesthesia. This analysis finds that these ipsilateral connections are exaggerated in this patient, which is perhaps just what we’d expect. How cool is that? If you’re familiar with Autonomous Sensory Meridian Response (ASMR), you’ve likely already drawn the association here. This is an experience characterized chiefly by tingling on the surface of the skin, and like the phenomenon we’ve discussed so far, it can be caused by an audible stimulus. The experience, around which there has formed a vibrant online community, might be described as euphoric. Stimuli videos like the one below are plentiful on YouTube. If you’re looking for a synesthesia test for this form and haven’t yet reached a conclusion based on the discussion so far, perhaps this is a place to start. How does your body respond to sounds like those in the video above? If you do experience a sensation, can you think of other circumstances where sound has triggered a similar feeling? I leave you with a playlist from YouTube user Aaron, a sound-touch synesthete whose primary stimulus is music. As always, feel free to leave comments describing your experiences. If you’ve read some of our other posts, you’ll know that—in the majority of cases—you are not alone in the theme of your perceptions. How do you experience auditory-tactile synesthesia? In this post, we bring you five synesthesia videos that are sure to expose you to something new about the sensory phenomenon! Each of these videos has something different to offer, and this sampling represents only a small fraction of the interwebs’ vast collection of videos on synesthesia and other neurological phenomena. So, without any further ado, let us begin! In this video, Kaitlyn Hova discusses a wide array of synesthesia types, highlighting how some of them relate to her career in music. Rather than focusing on spatial perceptions, this talk entertains the variety of ways in which the senses can be intertwined, showcasing several neat examples involving color. It also raises some great questions about how we understand the human experience and how large a role synesthesia might play in that experience. Check it out! Steffie Tomson, a graduate student of the renowned Eagleman Lab, offers what is probably my favorite two-word description of synesthesia – “sensory interplay.” She discusses cases of grapheme-color and lexical-gustatory, telling a humorous story about a not-so-pleasant tasting “Eric.” This one is short and sweet. In this short documentary, a young lady takes us through her experiences as a synesthete. She explains not only her synesthetic perceptions, but also some of the struggles that are inherent to perceiving the world around her differently than others. Conversely, she praises her mother and sister for their unwavering support. If you love comparing your experiences to those of others, this will be right up your alley. Richard Cytowic, a well-known neurologist and author, brings us what is likely the best info-per-second video on synesthesia in his TED-Ed, “What Color is Tuesday?”. While this animated gem is chock-full of interesting tidbits and foundational facts, there are two more subtle points that I’d like to extract. First and foremost: Synesthesia is not a disorder; it “is a trait, like having blue eyes.” Cytowic points out that there is nothing wrong with the synesthetic mind; in fact, it is likely to possess a better capacity for memory and recall. Secondly, “we’re all synesthetes.” Because “sight, sound, and movement already map to one another so closely,” we all have a bit of synesthete in us. Pretty neat, right? Bryan Alvarez of UC Berkeley discusses some of the traits that are common to synesthetic experiences. While this one is a tad more academic, it brings to light some of the fundamental differences between conceived perceptions and automatic, involuntary (and often consistent) synesthetic perceptions. Understanding these characteristics plays an integral role in identifying the phenomenon. ~As I mentioned at the outset, this is but a small sampling of the available video resources on synesthesia. I encourage you to leave a comment with a link to your favorite video or any thoughts you might have on those above. And, as always, thanks for stopping by! If you’ve ever accompanied a friend or family member on a doctor’s visit and sat in the very room the checkup ritual took place, you’ve likely had the fortune of empathizing with that friend or family member, watching as the stethoscope was pressed to the bare back, the reflex hammer hit the knee, or the vaccination needle penetrated flesh. Now, for a second (and no longer), imagine that, in watching these actions take place, you also felt them. A tingle on your back. A knock to your knee. A pinch on your skin. That is mirror-touch synesthesia. Think about the last time you watched someone take a bad fall or listened to a friend grind his or her teeth. For a split second, you cringe at the thought of physically feeling what they must feel. In a sense, we all empathize to some degree with the physical feelings of others. For an individual with mirror-touch synesthesia, however, the area of the brain that creates this empathy is hyperactive. These individuals don’t just cringe at the thought of comparable pain, but they might actually feel it themselves. For non-synesthetes, like me, the best way to relate to this sentiment might be to think about pains or ailments we’ve suffered and how those experiences have shaped the way we empathize when others have similar misfortune. For instance: I’ve never broken a bone, so I’m not sure that I can truly empathize with someone who does. I just can’t be certain of what it feels like. On the other hand, I have had a pretty deep flesh cut – so when I observe someone accidentally cut themselves when chopping up lettuce, I can certainly empathize with the sting. Are You a Mirror-Touch Synesthete? While the answer to this question might be painfully obvious (pun fully intended), there are actually tests for this type of synesthesia. One of them, wherein a sensory interference task is used to verify the presence of mirror-touch, is described here (complete with a nice diagram). 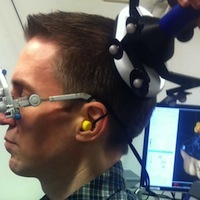 Another, which involves the user of fMRI, is discussed at length here. Piggybacking off of the first test I linked, we might design a simple synesthesia test ourselves. You’ll need two friends to help you – one standing behind you and the other in front of you. On the count of three, have the friend that you can see place a finger on one cheek, both cheeks, or neither cheek. At the same time, have the friend behind you place a finger on one of your cheeks, both of your cheeks, or neither cheek. At the end of each trial, have the friend behind you record what you felt (left cheek, right cheek, both, or neither), along with what each of the two friends physically did. You can label them “visible friend” and “non-visible friend,” or something like that. Repeat this process as many times as you’d like (try 50 or so to start), having your friends switch up their finger placements throughout the process. Once you have a nice collection of data, sit down and do some analysis. How many times did you feel that both cheeks were being touched when the visible friend was touching his or her right cheek and the non-visible friend was touching your left? Were there times when you felt that both cheeks were being touched, when in reality neither was? There are a range of possible combinations here, so it could get messy. Just something interesting to try on a rainy day! Interested in learning more about synesthesia? Subscribe to our monthly newsletter! Not bad, is it? To each his or her own, I guess. Anyways, it turns out that Taylor isn’t the only popular artist who’s tangled color and emotion in song. While some of you may actually experience emotion-color synesthesia, artists find the metaphor to be an incredible lyrical device. Whole songs (and in this case, albums) can hinge on the relationship between color and emotion. Let’s look at three examples, starting with ‘Red’. Grapheme-color synesthetes may relate the color red with the letter ‘A’, the number ‘1’, or other objects/words in the graphemic spectrum. (This young synesthete spells out her red perceptions in a YouTube video.) Emotion-color synesthetes, on the other hand, might involuntarily perceive emotions – perhaps anger, aggression, jealousy, love – as having the color red. This is subjective, of course. Love isn’t red for everyone! Pretty powerful stuff, isn’t it? The metaphor appears again in the hook’s emphatic finish. Whether Taylor Swift is synesthetic or not, she does a good job of bringing the real experiences of some alive for her many listeners. Bravo! Perhaps one of the more polarizing dance songs of our time, Eiffel 65’s ‘Blue’ took the use of color in song to an entirely new place. To this day, the color blue must invoke some sort of subconscious singsong in my mind’s periphery. It’s catchy; there’s no denying it. Have a listen. I’ll apologize ahead of time if you find yourself trying to make sense of the nonsensical chorus. Nothing like dancing to the sad (albeit uppity) song of another person, eh? Well – I’m not sure about that. What I do know is that – should there come a day when (for whatever reason) I need to scrawl ‘Eiffel 65’ on a piece of paper – I’ll be inclined to do so with a blue ink pen. In my mind, they’ve forever aligned themselves with this color. Now on the last example, I realize that, at one point or another, I’ve listened to each of these songs in rather irresponsible repetition – to the point of temporary ruination, even. Still, I have a certain appreciation for each of them – Coldplay’s ‘Yellow’ included. Smooth vocals. Catchy riff. I’ll catch you on the other side of the song. Pretty great, isn’t it? While Wikipedia indicates that the use of the color yellow may be completely arbitrary, I can’t help but think that it fits the mood of the song perfectly. Ostensibly, the song’s lyrics qualify the unrequited love of the band’s lead vocalist. Unrequited love seems yellow to me (a non-synesthete); how ’bout you? Whether yellow was chosen arbitrarily or not, I can’t help but appreciate its thematic presence throughout the song. Unrequited love is yellow, folks. We’ve reached the end of our examples. I hope you’ve enjoyed the music. I encourage emotion-color synesthetes (hopefully you come in droves – ha!) to share their experiences with emotion and color. As previous post comments have shown, you tend to learn a lot from one another! Also, it provides great insight for all of us non-synesthetes. The floor is yours! One of the great things about operating a blog on synesthesia is that – on a daily basis – you have the chance to live as a figment in the experiences of tremendously unique individuals. We’ve been privileged enough to attract a readership with a propensity to share, and we can’t express gratitude enough for your continued emails and comment contributions. Keep ’em coming! Aside from this common thread of “enjoying reading about others’ experiences,” we’ve had a number of users express interest in contributing to a synesthesia research study. While doing so physically (or in-person) might be preferred, it isn’t always feasible. Lucky for all of you proximity-plagued folks, there are awesome opportunities for remote participation. One such opportunity – provided by the St. Louis Synesthesia Research Team (a lab directed by Dr. Berit Brogaard) – requires that you simply share your experiences with the research lab via email. An easy way to make an impact on research in the fields of neuroscience and synesthesia; all it takes to begin is one email. Additionally, the St Louis-based lab (with collaborators around the globe) provides three different 10-question surveys that synesthetes can fill out online. The surveys are titled: Advanced Synesthesia, Migraine Aura and Synesthesia, and Special Talents. Check ’em out. Fill ’em out. Become a remote contributor! Kristian Marlow, a graduate student at the University of Missouri in St. Louis and point-of-contact for the research lab, was kind enough to answer five questions that we posed about synesthesia and research. Frankly, I was blown away by his genuineness and thoroughness in his responses. I can’t urge you enough to read on. 1. Why did you become interested in researching synesthesia? Synesthesia research is actually a pretty recent addition to my life. A few years ago I started to become very interested in the philosophy of perception. In this discipline, a lot of time is spent trying to find empirical evidence that supports or undermines certain theories of how the mind works. I learned that research on synesthesia offers particularly good empirical evidence in these types of disputes. As I studied synesthesia, I kept coming across questions I thought I could solve and since then have spend a lot of time constructing experiments to satisfy my interests. We have a few studies coming out this that that hopefully will address some of the big research questions. 2. What is the most interesting type of synesthesia you’ve encountered? Not being a synesthete myself, I find all types of synesthesia fascinating, from the most common types like week-color and grapheme-color synesthesia to uncommon ones like motion-sound or person-taste synesthesia. Researchers like me find that no two synesthetes are exactly alike, which is interesting in itself. But some synesthetes have experiences that are incredibly unique. One of our case studies, Jason Padgett, has visual experiences of well-formed formulas. He’s spent a lot of time drawing these and actually sells the drawings as art. They really are beautiful. It turns out that some of these drawings approximate the same patterns that have only recently become producible on computers. A while back, we did functional MRIs of JP’s brain and found that visual imagery from well-formed formulas is processed in a completely different part of the brain than is normally associated with visual imagery. That unexpected result was really cool. Another one of our case studies, Lidell Simpson, has always heard sounds associated with motion. He was born profoundly deaf and only started using hearing aids when he was diagnosed with mixed hearing loss at the age of 5. There is a debate among researchers whether the mind can generate true sounds without any auditory stimuli, but this seems to be a clear case where that has happened. He also hears a “ping” associated with everyone he knows. He has found friends in crowded spaces just by following the pings. One other extraordinary case is that of Derek Amato. He hit his head on the bottom of a pool and awoke 3 days later able to compose classically structured music, even though he has no formal musical training. He constantly sees different colored blocks move across his visual field. He plays the piano by following these blocks with his fingers and has become pretty famous for this extraordinary talent. 3. Which special synesthete talents show up most frequently? Synesthetes are most often found in the arts. Many famous painters and musician are synesthetes. We don’t really know why this is the case. These synesthetes often claim that their synesthesia helps them with their art. There have been a few cases where synesthesia can be very helpful for long-term memorization and mathematical calculation, but that appears to be rare. 4. Who is your favorite famous synesthete? Why? I would be lying if I said I didn’t have a favorite famous synesthete. It’s Wassily Kandinsky, the Russian painter and art theorist. From the moment I first came across “Composition IV” as a freshman in high school, I knew that my goal was to have that painting hanging in front of my desk. I would later learn that his paintings sell for upwards of $20M. Historians believe that Kandinsky painted his synesthetic imagery. I was so pleased to learn this fact about such a brilliant artist. How fascinating is it that such beauty can emerge from synesthesia? 5. What is the best way to get involved in synesthesia research? There is a lot of uncharted territory that researchers are starting to cover. Many synesthetes get involved because they are interested in learning more about why they have these experiences. But the truth is we aren’t even close to knowing why. The easiest way to get involved is through an academic institution with a lab already studying synesthesia, usually made up of philosophers or neuroscientists (although faculty from other disciplines study it as well). Some labs are well-known for their work on their topic. These include the St. Louis Synesthesia Research Team at the University of Missouri-St. Louis and the Eagleman Laboratory at Baylor College of Medicine in Houston. But you don’t have to be at an academic institution to take part in research. There are many books on the subject (a list is available on our team’s blog) and there are events held through organizations such as the American Synesthesia Association. 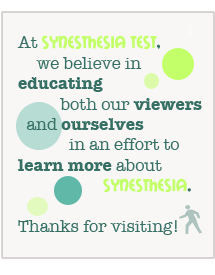 And, of course, our team is always looking for synesthetes to participate in studies. Incredible stuff, right? I’d like to extend a personal thank you to Kristian (and his lab) for the contribution. And, in closing, I’ll encourage any synesthetes out there to head on over to the team’s website and (if you fancy so) to participate in their research. That’s all for now, though! Thanks for stopping back!